As a partner organisation of ADVANTAGE AUSTRIA, we offer information and advice to export-oriented companies. We have been providing local businesses with information on internationalisation for over 10 years. Taking the first steps on the export journey should not be a venture into the unknown with unforeseeable risks. In order to simplify the path for Styrian businesses into trading internationally, the ICS Internationalisation Centre Styria (Internationalisierungscenter Steiermark – ICS) was established in 2005 as a joint initiative of the Styrian Economic Chamber (Wirtschaftskammer Steiermark), the Province of Styria (Land Steiermark)/ Styrian Business Promotion Agency (SFG) and the Styrian body of the Federation of Austrian Industries (Industriellenvereinigung Steiermark). Since then, obtaining valuable information on export opportunities has never been this straightforward. 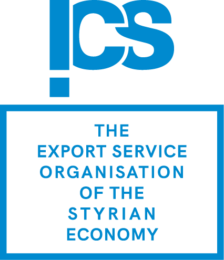 From legal aspects of international trade and funding opportunities to financial advice, valuable information on important topics is now available in one place: The ICS serves as the one-stop-shop for Styrian exporters and their questions on internationalisation. Valuable information is available immediately thanks to our extensive partner network and database. If necessary, special information can be obtained from other sources in very little time. The ICS offers practical support to help Styrian companies start operations abroad, enter new markets and step up their activities abroad. Not only does the ICS provide advice and support in export business plans, we also offer focus programmes for the purpose of putting interesting new markets on the radar of new exporters. Trade commissioners’ meetings, seminars on sectors and specific country information help facilitate the entry into future export markets. • The ICS offers personal advice to Styrian companies looking at expanding their export businesses and to those considering international trade for the first time. We provide information on various support programmes for exporters such as the go-international initiative with a capacity of 56 million Euro and numerous direct subsidies and the funding scheme Welt!Markt, initiated by the Styrian Business Promotion Agency (SFG). • The Export Academy is the ICS’s new qualification programme. Structured in several modules, expert training sessions are offered regularly and thematically following the “export life cycle”. Sessions can be repeated depending on demand. Focus countries of the ICS in 2018 are Mexico together with Chile, Peru and Colombia. As part of the new country focus, we offer various seminars, ranging from export management, structure of distribution channels, establishing a branch, product authorisation, business culture as well as trips abroad. • The new online marketplace is an online resource which provides help in finding international business partners. You have the opportunity to search for countries and sectors of interest as well as to publish your own company profile.